Predisposed as he was toward the "mysterious," and living with the Tahi-tians, Gauguin naturally tended to legendary and mythological subjects. His allegorical figurations, such as the Moon and the Earth in this painting, can be traced back to no single source. They are compounded of memories of European painting, the stories of his Tahitian friends (especially Tehura, his young native wife), and his reading of native history and myth. Above all, they grow from a fundamental sense of symbolism of an "enigma" that exists beneath the surface of the world's appearance. Here in Tahiti, as previously in Brittany, he tried to render this through the eyes of simple people, to capture something of their sense of wonder, and their acceptance of the incomprehensible workings of the universe. 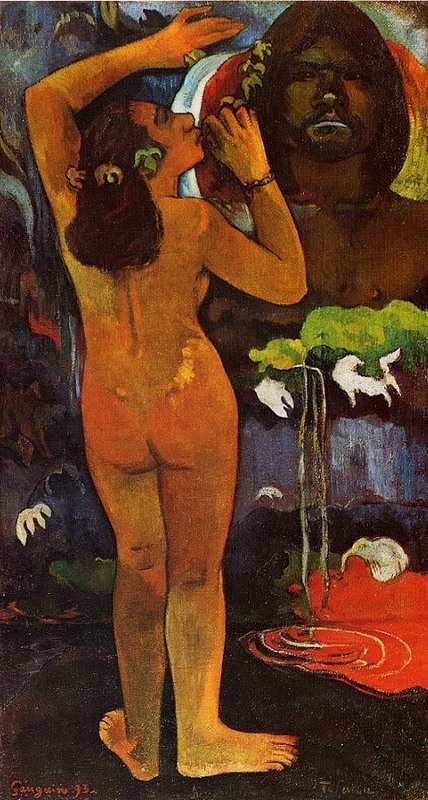 The specific subject comes from a legendary dispute between Hina, the moon, and Fatou, the earth that Gauguin (following Moerenhout) describes in his Ancien Quite Mahorie. Hina said to Fatou, "Make man live or rise again after death." Fatou answered, "No, I shall not revive him. The earth shall die, the vegetation shall die, it shall die like the men who feed upon it. . . ." "Do as you like, but I shall cause the moon to be reborn." The myth does little to explain Gauguin's rendering. The canvas is curious in its mixture of the immense modeled figures and the flat patterns of motifs from nature, abstract and repetitive in form. It is almost as though Gauguin were saying that the myth, product of the imagination, is more real than any observation of nature. Contrary to traditional allegory, the scale of the symbolic figures is out of all proportion to their surroundings, so that far from being humanized, these gods loom before us powerful and terrible. This picture was reproduced on the cover of the catalogue of Gauguin's exhibition at Durand-Ruel in November, 1893, when it was bought by Degas.